Theme Party Inspiration: Pot of Gold — Everybody's Invited! Top of the muffin (err, I mean mornin’) to you! In honor of St. Patrick's Day, I created a Pinterest board full of ideas for throwing a “Pot of Gold” theme party. I love gooooooold! For this party, you will need gold (and lots of it!). Add pops of emerald green and white, stripes, polka dots, and shamrock motifs throughout the decor. We love these simple and modern invitations from Etsy. 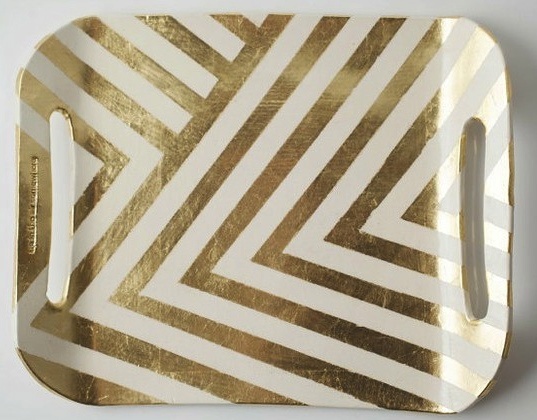 Set the table with this gorgeous stripey tray. Sip shamrock shakes with retro gold and white striped straws. And serve Irish coffees in these adorable polka dot mugs. You may not find actual gold at this party, but shamrock macaroons, pot ‘o gold popcorn, and pot ‘o gold cakepops are almost as good in my book. Your guests will feel good as gold after sipping a few of these sparkling “Pot of Gold” cocktails. Guests will think you have a heart of gold when you send them home with these homemade lucky clover bags filled with chocolate gold coins. One lucky leprechaun could find a pot of gold at the end of a St. Patrick’s Day scavenger hunt. Although a little cliché, photobooths are always fun! Feel lucky (and pretty!) with this four-leaf gold clover around your neck. We totally struck gold when we came across these shoes; they’re perfect! Not only are they gold, they’re also really leprechaun-y. Head on over to our Pinterest page to find a gold mine of ideas for throwing a “Pot of Gold” St. Patrick’s day theme party!